January 30, 2019 Voratape Kijtavee, M.D. Even with only one blood relative in your immediate family with breast cancer, as a woman you have a higher risk of breast cancer than others. BRCA genes are tumor suppressor genes. A mutation in this gene can indicate an up to 90% breast cancer risk and an up to 50% ovarian cancer risk. Breast surgery for those with risks related to BRCA gene mutations can reduce the incidence of breast cancer, as in the case of well-known actress Angelina Jolie. If parents have cancer, does it mean their children will have cancer as well? Cancer is caused by gene abnormalities causing unchecked, abnormal cell division and growth. These types of abnormalities are not caused by genetics alone. It has been found that only 5-10% of cancers are inherited. This is because we inherit half our DNA from each parent, passed on via chromosomes from both father and mother to their children. This means that the chance of hereditary cancer is 50:50. Having a family member with cancer does mean that a child has a higher risk of cancer than those without a family history of cancer. At the same time, however, we must remember that most cancers come from preventable causes, and when we learn how to avoid the risk factors, the risk of disease is also reduced. One of the causes of breast cancer is mutations or an abnormality in the genetic code of the BRCA gene. There are two of these genes known as BRCA1 and BRCA2. Their main function is to repair DNA damage. Therefore, if there is a change in the DNA code of these two genes, this causes a malfunction. Damaged DNA is not repaired, resulting in higher chances of breast and ovarian cancer. We are all born with two sets (23 pairs) of genetic information or “DNA”. Of each of these 23 pairs, one was received from our mother and the other from our father. BRCA gene mutations can be transmitted from either the father or the mother. If there is a family history of breast cancer, whether on the father’s or the mother’s side, this can indicate that there may be a harmful BRCA gene mutation in that family and those who inherit this gene mutation then have a 90% increased risk of breast cancer and 50% increased risk of ovarian cancer. This is why well-known actress Angelina Jolie decided to undergo a double mastectomy after testing showed that she was a carrier of the BRCA1 genetic mutation. In her case, she had a family history of cancer, with her grandmother passing away from ovarian cancer and her mother suffering from both ovarian and breast cancer, and eventually also passing away at an early age. However, it has been found that, in Western countries, only 1 in 10 of all breast cancer cases is due to a main genetic cause, and it is estimated to be even less in Thai people. Other risk factors, such as pregnancy, hormone therapy, diet and even lifestyle, can all increase or decrease the risk of cancer. 2% of all people have one or more of these family history risk factors. If you do not have any of these family history risk factors, it is highly unlikely that you will have BRCA1 or BRCA2 gene mutations. 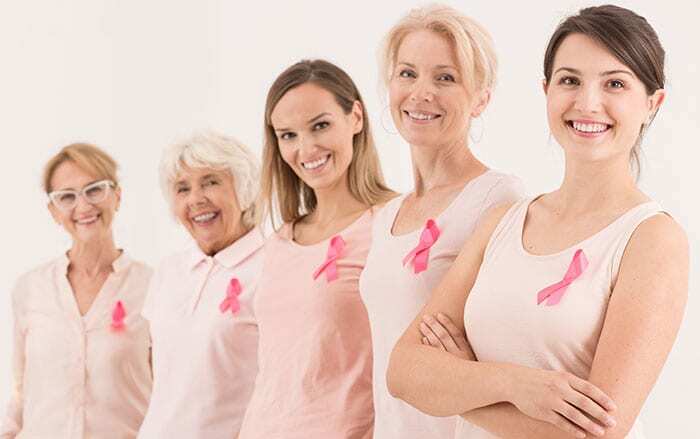 For those without a family history as outlined above, regular self-breast examinations, taking good care of your own health, regular exercise and yearly checkups and mammograms are some of the best ways to prevent breast cancer. As a recent development, next generation sequencing technology with saliva analysis has resulted in the significant reduction of screening costs. Saliva analysis also dramatically reduces the turnaround time of diagnosis from what originally took 6-12 months, to results now being available in 1-2 weeks only. Accuracy in detection of tumors in unusual locations has also become much more precise. In addition, multiple locations can be examined for gene mutations at the same time and, as a result, multiple gene mutations can be detected simultaneously. This means that other abnormalities and disorders can be detected, and not only breast cancer. Saliva analysis therefore may be another screening alternative for those who are concerned about their level of risk. Hereditary Breast Cancer BRCA genes are tumor suppressor genes. A mutation in this gene can indicate an up to 90% breast cancer risk and an up to 50% ovarian cancer risk. M.D., Faculty of Medicine, Khon Kaen University, 2005.